They are impossible to solve. They are too time consuming. The documents don’t exist. 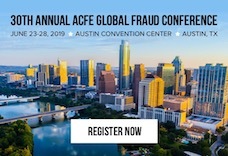 Tiffany Couch, CFE, CPA/CFF, Principal Acuity Forensics, reviewed these three myths surrounding cash skimming schemes to start off her breakout session at the 28th Annual ACFE Global Fraud Conference. She shared four case studies to dispel these myths and illustrate a few ideas on how to effectively investigate and prove cash skimming schemes. We’ll take a deeper look at one of them, which she dubbed the “Busy Mom” scheme. According to the ACFE’s 2016 Report to the Nations, the No. 1 way fraud is detected is through tips. However, the most prevalent anti-fraud control put in place by companies is external audits. About 80 percent of survey respondents cited external audits as an anti-fraud control while only 54 percent cited tips as a control. According to Tiffany Couch, CFE, CPA, CFF, Principal of Acuity Forensics, these statistics tell auditors an important story. “I went into prison thinking my life was over, but it turned out to be a lifesaving and life-changing experience,” said convicted fraudster* Nathan Mueller during the closing General Session of the 26th Annual Global Fraud Conference in Baltimore, Maryland. During his incarceration, he told attendees, he became “the person I always wanted to be.” Unfortunately, Mueller and his family had to travel a rocky and costly path so he could become a changed man. Investigators and auditors bring their own sets of tools to an investigation. In the investigator’s tool kit are interviewing skills, knowledge of the law, collecting and preserving evidence know-how, and honesty and ethics. Auditors bring different assets: integrity, independence, an attention to detail, internal controls experience and expertise in collecting hard copy evidence.